Left to right: Robert S. Chase; William H. Seward (Secretary of State); William Hunter; Mr. Bodisco; Baron de (Eduard) Stoecki (Russian diplomat); Charles Sumner; and Frederick W. Seward. ASL-P20-181, http://vilda.alaska.edu. Courtesy of Alaska State Library—Historical Collections. A print from the painting by Emanuel Leutze showing the Alaska Purchase. Anchorage Museum Auditorium, 7:00 p.m. The theme of 2017-2018 Cook Inlet Historical Society lecture series is 150 Years: Defining Moments in the Great Land. This year marks the sesquicentennial of the Treaty of Cession between Russia and the United States (1867-2017). Over the past century and a half, Alaska has undergone remarkable change. Its Native population has persisted and thrived; settlers have arrived from around the world; the culture and economy of the territory and then the state has transformed several times. Throughout the fall and spring of 2017-2018, the Cook Inlet Historical Society will present lectures on some of the topics that have defined Alaska’s history since the cession. September 21, 2017, 7:00 p.m.
Thursday, October 19, 2017, 7:00 p.m.
UAA Distinguished Professor Emeritus Stephen Haycox will moderate a panel discussion with Russian historians about why Russian America was sold to the United States and three indigenous speakers who will examine the consequences of the 19th century Americanization of Alaska and the later Cold War. Participants include Sergei Grinev of St. Petersburg, Russia; Ilya Vinkovetsky of Simon Fraser University of British Columbia; Andrei Znamenski of the University of Memphis, Tennessee; archivist/historian Joaqlin Estus (Tlingit); and Andrey Khalkachan, a Native of eastern Siberia. Thursday, November 16, 2017, 7:00 p.m.
Thursday, January 18, 2018, 7:00 p.m. 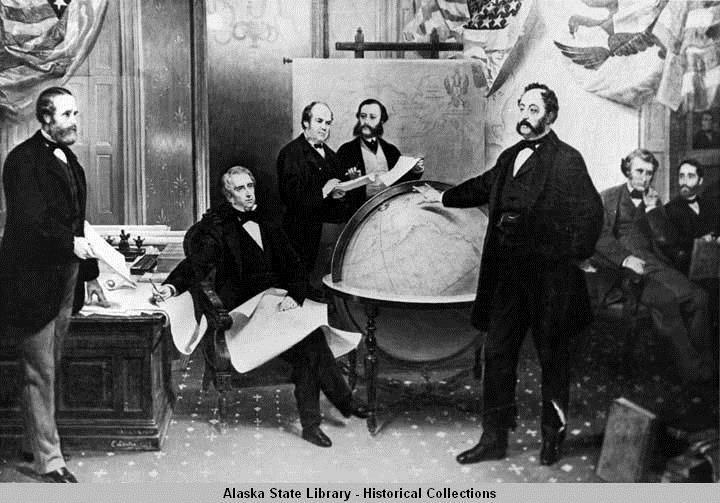 The Alaska Commercial Company (ACC) began mercantile services in Alaska within months of the Treaty of Cession. Early company activities included fur trading, banking, shipping, and building infrastructure as well as operating an exclusive 20-year lease of the lucrative Pribilof Islands fur seal industry. This presentation details the 150 years of ACC operations in Alaska. Wasilla was founded in 1917 when the Alaska Railroad intersected the Carle Wagon Road that headed into the Willow Creek Mining District. Miners were supplied by merchants in Wasilla and a thriving community emerged. Well-known members of the early community, how their history shaped Wasilla, and the activities of the centennial celebration that brought these stories and history to life will be discussed. Alaska’s strategic military position is based on geography. Alaska is an ideal hub for the great “Over-the-Pole” circle routes connecting the Orient with Europe and North America. JBER’s location is much closer to the Orient and Europe than many parts of the contiguous United States, and provides an ideal staging for a rapid military response capability today, just as it did during World War II and the Cold War. In this lecture, JBER Command Staff will discuss the strategic geopolitical importance of Alaska today and in the past. ​Thursday, May 17, 2018, 7:00 p.m. This concluding lecture will discuss the federal government’s role in managing public land in Alaska. The Alaska National Interest Lands Conservation Act (ANILCA) signed into law in 1980, was an achievement in the environmental movement and an important domestic achievement in the environmental movement and an important domestic achievement for the Carter administration, according to some. Others view it as federal overreach and a law that has continued to hinder Alaska’s economic development. Whatever your perspective, few would disagree that ANILCA profoundly transformed the management of Alaska’s public lands. The panel discussion features a diversity of analysis as we come to grips with, and better understand, this landmark legislation. Following annual tradition, Audrey and Bruce Kelly will select a number of gravesites prominent residents buried at the Anchorage Memorial Park Cemetery for a fascinating historical review of our community in a different era. Please enter the Cemetery at Bagoy Gate—7th and Cordova Streets. There will be a printed souvenir brochure.